The Renwick Gallery, part of the Smithsonian American Art Museum, is devoted to contemporary craft and decorative art. The museum is located right around the corner from the White House. The museum boasts a storied history: the National Historic Landmark is the third-oldest Smithsonian building, and is the first building constructed in America designed to be an art museum. The Second Empire-style building, a National Historic Landmark, was initially built to house the private art collection of Washington banker and philanthropist William Wilson Corcoran. The Renwick Gallery is one of the most elegant examples of Second Empire architecture in the U.S. James Renwick Jr., the architect who also designed the Smithsonian’s Castle and St. Patrick’s Cathedral in New York City, designed the D.C. building in 1859. Renwick found himself inspired by the Louvre’s Tuileries addition in Paris and modeled the gallery in the French Second Empire style that was popular at the time. By 1897, Corcoran's collection had outgrown the building and the gallery was moved to its location across the street. The U.S. Court of Claims took over the Renwick Building in 1899. First Lady Jacqueline Kennedy faced down opponents who planned to demolish the gallery to make way for more office space. In 1972, the Smithsonian restored the building and established it as a gallery of American art, crafts, and design. The Renwick Gallery underwent a two-year renovation and reopened in November 2015 with a splashy exhibition called "Wonder" that appealed to the Instagram generation. The renovation included carefully restored historic features and entirely new infrastructure. The Smithsonian is celebrating the artwork of Burning Man in a nearly year-long exhibition at the Renwick Gallery. From now through January 21, 2019, see "No Spectators: The Art of Burning Man," and get up close and personal with experimental art installations from the annual psychedelic week-long festival in Nevada’s Black Rock Desert. The exhibit takes over the entire museum and includes immersive room-sized installations (don't miss FoldHaus’s Shrumen Lumen, or illuminated mushrooms that visitors can interact with). The show includes costumes, photos, and jewelry from Burning Man's desert, or the "Playa," as it's known. There's also a virtual reality component so visitors can virtually experience the Playa for themselves. "No Spectators: The Art of Burning Man" spills out into the street too, with artwork stationed outside in the Golden Triangle neighborhood surrounding the museum. Check the Renwick's website to see a map of where the artworks are located in case you want to take a self-guided walking tour. The museum is open from 10 a.m. to 5:30 p.m. every day except Christmas. 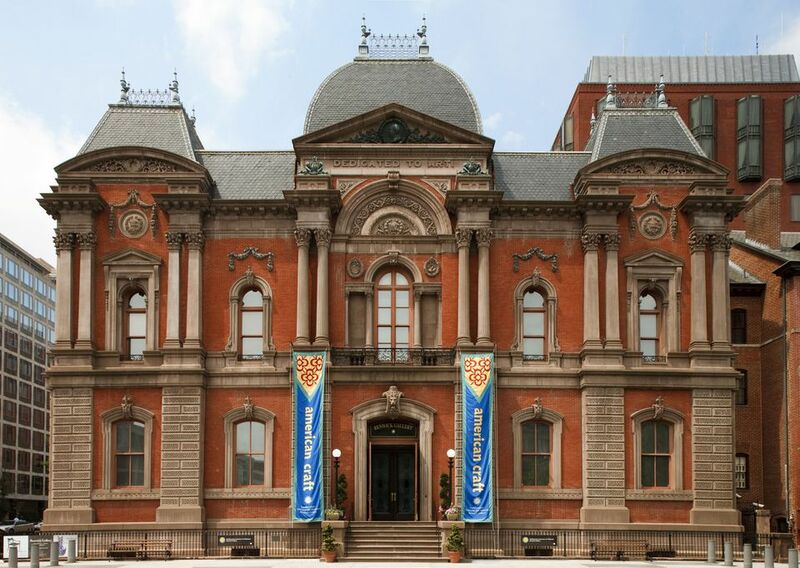 Located just steps from the at Pennsylvania Ave. and 17th St. NW, the Renwick Gallery is accessible via Metro with a short walk from the Farragut North and Farragut West metro stations. (Here's a map). Parking is very limited in this area. For suggestions of places to park, see a guide to parking near the National Mall. Like other Smithsonian museums, there is no fee to enter. A barrier-free access to the museum can be found at the 17th Street entrance. For parents with young children, know that in order to protect the artwork, strollers are required to be parked at this entrance on Friday, Saturday, Sunday, holidays, and at other times when the galleries are especially crowded. The Renwick is in the center of historic federal Washington, making it easy to combine a visit to the gallery with a quick stroll nearby to take photos of the White House and Lafayette Park, the seven-acre green space across from the White House. The Eisenhower Executive Office Building that houses much of the White House staff is nearby as well. Like the Renwick, the building showcases the flamboyant style of French Second Empire architecture. Another museum downtown to check out is the National Museum of Women in the Arts, the world's only major museum dedicated solely to female artists. Keep walking, and you'll soon hit the Mall and the Smithsonian Museums in Washington, DC.